Translation services that can help provide clear and concise communication between financial industry institutions and professionals. 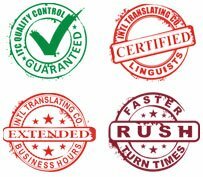 Therefore, it is imperative that your company use professional translation services for those international financial transactions and relationships. Seeing eye to eye on such transactions is critical. Put us in your corner on a deal and you will be confident in the additional insight our translators, interpreters and trainers will give you.